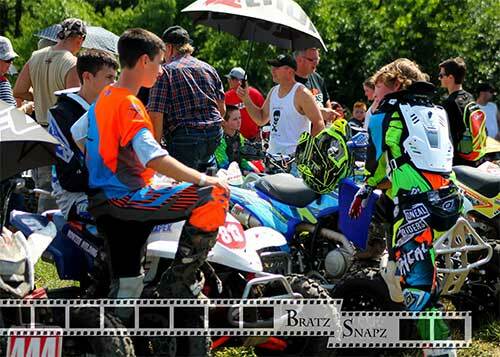 Saturday Youth ATV: 50cc Stock, 50cc Production, 70cc, 90cc Stock, 90cc Production. 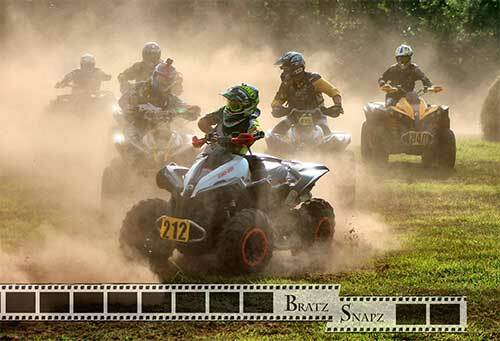 Sunday Adult ATV AM: 16-25 C, +26 C, +50, Utility, Women's, 1st Year, Junior (13-15yr), Sportsman. Sunday Adult ATV PM: AA, A, OPEN Utility, 16-25 B, +26 B, +30, +40. 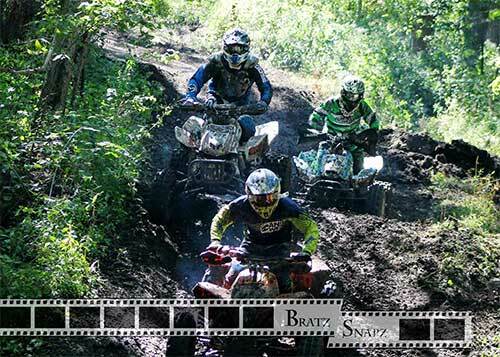 2017 IATVHSS Supplemental RULES: The following rules and regulations supplement the AMA Amateur Competition Rules, and are solely applicable to Iowa ATV Hare Scramble (IATVHSS) events operated by IATVHSS, L.C. The rules and/or regulations set forth herein are designed to establish minimum acceptable requirements and to provide for the orderly conduct of racing event. 1. Current 2017 ATVA/AMA rules established for hare scramble competition shall apply. 2. All competitors must belong to the ATVA or AMA, and must have membership card at the track the day of the Race. If you forget it or loose it you will be required to purchase a new membership that can be credited for another year. They do not do refunds! 3. The Promoter/IATVHSS Officials has the final say in all disputes. 4. The Promoter/IATVHSS Officials shall have the authority to penalize, disqualify and/or suspend any entrant or crew member for the violation of these rules including special rulings. 5. The Promoter/IATVHSS Officials may issue special rulings to account for conditions presented by the location of the race, the condition of the course and or any other circumstance. 6. Supplementary regulation may be issued for each event as necessary to amend, suspend or modify existing rules and regulations. 7. IATVHSS, L.C. members are not employees of IATVHSS, L.C. Members assume all responsibility for all charges, premiums and taxes payable on any funds they may receive as a result of their participation in an IATVHSS, L.C. event. 8. IATVHSS, L.C. reserves the right to refuse and/or deny any entry application. 9. All riders are responsible for attending Riders Meeting. 10. Riders must not exceed 1st gear idle when traveling to and from their pit area and must always wear a helmet. 11. Riders must register for the race before riding their machine anywhere. 12. A front and rear facing number plate is required. It must be 6" minimum and clearly visible from a distance of 50'. Colored backgrounds that match the class color are required. Plate may be on quad or chest protector. 13. 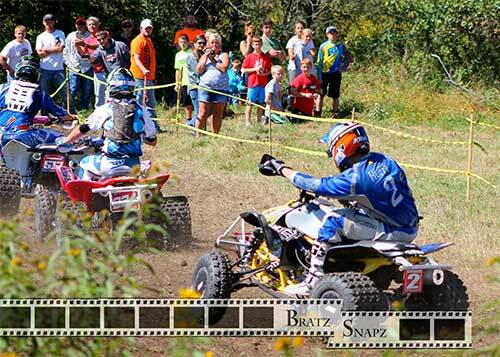 Do not ride quads/ATVs right up to registration. Stay behind roped off area. 14. All quads will have their tether checked on the line. 15. PIT CREW. Riders are responsible for the actions of their entire pit crew. If any crew is caught on the track on a motorized vehicle, rider will be dqued. Crew can be on track on foot. There will be some races where riding is allowed – only to designated path. PIT VEHICLES: Spectator and pit riding is prohibited. 16. Riders may not be serviced or pitted near the finish or scoring area. 17. Radios are permitted between pit crew members, but not with riders. 18. Rider Contact: Deliberate ramming, blocking, or intentional contact with another rider may be cause for penalty. 19. Rider Conduct: Unsportsmanlike conduct may result in penalty, including disqualification. 20. Riders will be disqualified for riding the course during the 7 days prior to the day of the event. 21. A rider may petition in writing to the IAVTHSS to move to a lower classification, and will be judged based on class finishes and time differences. 22. If racer under the age of 18, who's parent cannot accompany them to the race, rider must provide a notarized letter from their parent to participate. 23. Any entry who fails to fully fill out and sign required entry forms and release shall be disqualified, shall forfeit any prize money and points in that particular event. 24. No entry may enter racing areas until they have signed all releases and/or entry forms. No person shall sign the release or entry forms for anyone other than himself or herself. Proper id may be required. 25. Any entrant who competes on a vehicle that he/she is not registered to ride or permits such action, shall forfeit any and all prize money, points won in that particular event..
26. Alcohol, narcotics or fireworks (including sparklers) in designated pits, on the race course or in the surrounding areas by any person is strictly forbidden. Any entrant or crew member in an event that shows evidence whatsoever of being under the influence of any of aforementioned or have possession of fireworks (including sparkers) shall be subject to suspensions from all future IATVHSS, L.C. sponsored events. 27. Any entrant who makes a false statement on a contingency or entry form shall be disqualified and shall forfeit all prize money, points and all contingencies won in the race. Entrant may also be suspended from future events for a period of one year. 28. Any entry application containing a falsified signature will cause entrant to be disqualified and shall forfeit all prize money, points and all contingencies won in the race. Entrant may also be suspended from future events for a period of one year. 29. Any entrant disqualified from any event for any reason whatsoever forfeits any and all rights to prize money, points and contingencies. Entrant will not be entitled to a refund of all or any portion of his/her entry fee. 30. Any entrant, respective pit crews or support crews seen or reported traveling on the course in other than race-registered vehicles participating in the event before the end of the official race time limit may subject entrant to penalties of disqualification and/or suspension. There is no outside assistance permitted on the course or near the course during the event except for those IATVHSS designated areas for pits and/or gas stops. 31. IATVHSS, L.C. retains the right to asses each situation and respond accordingly (situations involving safety are at the discretion of the race director. 32. IATVHSS, L.C. strongly recommends that entrants use helmets specifically designed for racing. 33. Inclement Weather: Events may be conducted regardless of weather conditions. In the event of rain or other unfavorable conditions, it may be necessary to alter the order of the event schedule, including but not limited to, adjusting the length of the race or delaying or stopping the program completely. Should a delay occur, every effort will be made to resume the schedule in a timely fashion if conditions significantly improve. 34. Spectator and pit riding is prohibited. 1. Riders may only enter one race per day. Only exception is 13-15 yr olds; they can ride in mini 90cc and the Junior Class. 2. Riders under the age of 18 must provide a photo I.D. or Birth certificate for proof of age upon request at time of registration and be accompanied by a parent or legal guardian. 3. Entries Fees: Pre-registered racers receive a $5 discount. Pre-registration via mail when received by Thursday prior to race weekend. 4. Riders will receive a transponder upon registration. The transponder must be placed inside of the visor of your helmet. First transponder will be free. Riders will pay for any additional if needed. 5. The entry applications of persons under the age of 18 must have a parent or legal guardian sign the release form. If parent cannot be there, you must bring birth certificate and notarized letter from parents stating they are okay with you racing. 6. Must bring helmets to registration. Production ATV: OEM motor and matching frame combination model required. Engine modifications, frame reinforcements and frame modifications to permit longer rear-wheel travel are permitted. Utility ATV: per manufacturer specification; sport utility only. Example, a Scrambler is listed as a sport utility so it will be allowed in the utility class (Wolverine, Rubicon, Sportsman, Rincon, Recon, artic cat, etc). A V-Force is listed as a sport machine so it will not be allowed in utility. Open ATV: 91cc and over engine, so long as the cylinder is stamped with the correct engine displacement. Stock ATV: All motor components and rear suspension must remain stock. Aftermarket replacement parts may be used so long as they maintain the same basic design and material of OEM parts, do not improve motor performance, add travel to the suspension, or have a reservoir. Example: must have stock pipe, silencer, carburetor, air box, air cleaner, rear shocks, etc... May change tires (excluding Tire Balls), wheels, throttle assembly, axle, handlebars (excluding handlebars with bushings), can race with steering stabilizers, grips, skid plates, plastics and seat covers, including those that add traction (but do not change seat height). May add bead locks, nerf bars, foot pegs, foot peg extensions, and open or closed-end metal or plastic hand guards. May not add larger fuel tanks, quick-fill fuel systems, steering stems, automatic clutches, front shock reservoirs, or modify or remove front shock reservoirs from machines that come equipped with them. 50cc Stock ATV: Same as stock rules but this class is limited to "Yard" type 50's, Polaris, Kawasaki, Etc. No race ready ATV's. 1. The machine a rider leaves the starting line on is the official machine of the rider for that event, and he may not switch during the event. 2. No rider is allowed to carry gasoline except inside his machine's fuel tank. 3. All ATV's must be equipped with a functional tether type mechanical kill device attached to vehicle and rider so that the engine ignition is cut off at any time when the rider becomes separated from the ATV. 4. All helmets must be brought to scoring for the purpose of inspecting barcode placement, number assignment, and contingency eligibility. Safety equipment and machine eligibility are the sole responsibility of the rider. 5. Adult Classes - Rider number, minimum of 6" high, must be visible from the front and rear of the machine or rider in the class color. 6. Youth Classes - Rider number, minimum of 6" high, must be visible on machine or rider. Rear numbers are required. Can be on quad or chest protector. 7. Riding Boots, Gloves, Long sleeve shirt and long pants are required for all riders. 8. Safety equipment and machine eligibility are the sole responsibility of the rider and may be tested at anytime prior to, during or after event. A Youth Quad rider's age on January 1 will determine his age for the year. • No Cobras and No Apex Shifters - In the spirit of growing youth classes, in order to keep cost down and competition close, we have chosen to not allow cobras or Apex Shifters in the youth classes. • Novice riders not ranked in the top three in their class in any other off-road series in the current or previous year-end standings. • 26 year old rider may finish the season if there birthday is after the date of the first race that they participated in. • 26 years of age or older. • A 4 wheel or 2 wheel drive shaft or chain driven automatic transmission/clutch ATV that comes with racks or rack availability as standard equipment. • Any 1st Year Racer that has raced 3 races or less. • For Fun Class - No Points or Championship. • Riders placing 1-15 at any event the previous year in any AMA “A” class race; or by Promoter/Referee discretion. • Production rules do not apply. • All riders in the top 10 overall ranking in any regional or state hare scrambles series. 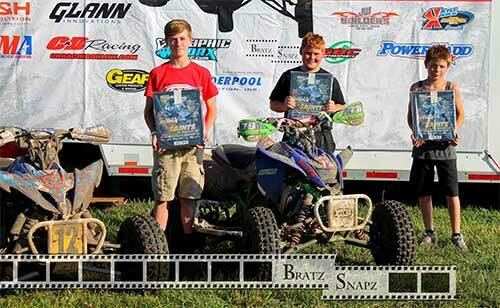 • All riders that have an "A" ranking in any other off-road series. • All “B” class championships in the previous year’s IATVHSS. 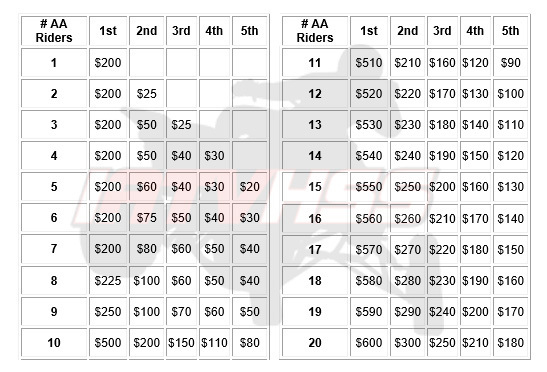 • All riders that do not qualify for the “”AA”, "A" or "C" classes. • All “C” class championships in the previous year’s IATVHSS. • All "C" riders ranked in the top ten of their class earning at least 50% of the points earned by the class champion in the previous year's IATVHSS. Ranking is based on year-end series. • All riders that have a "B" ranking in any other off-road series. 2. TECH $150.00: Person protesting must fill out form at registration along with $150 cash. If racer is found illegal, $100 will go to protester. If racer is found legal, the $100 will go to the racer. $50 will go to the person doing the teching. 3. All youth classes will be started with engines running and hands on helmets. 1. A course may include trails, footpaths, roads, hills, motocross tracks, or any type of terrain which can be negotiated by an ATV. 2. The course will be open to inspection at Noon the day prior to the race. Participants are permitted to walk or bicycle the course only. 3. Marking, cutting, tampering with or otherwise changing the course in any manner is strictly prohibited. Course modifications may only be made by an IATVHSS official. 4. Only registered racers and officials may ride the course during the race. 5. If a rider leaves the course for any reason he must re-enter where he left. If the rider must return to the Pits (for gas, tires, etc), the rider must re-enter the track after scoring and restart the lap they were on. 6. Riders must remain on the marked course. A marked course is that official route designated by and marked with official IATVHSS, L.C. markings. 7. Riders must stay within the confines of the following “direct path” markers: double arrows posted on both sides of the trail, ribbons, signs, stakes, hay bales, barrels, motocross track, grass track, etc.. Furthermore, riders may not cut to the inside of any corner marker. 8. Riders encountering a traffic-jam or bottleneck may go within than 25 feet off the course to get around the bottleneck as long as no “direct path” markers are compromised. However, the rider must re-enter the course as soon as possible, and upon approaching this section the next lap, must ride the original arrowed section if the track is clear. If the original marking devices are knocked down, the rider must stay on the original marked course. A "bottleneck" is a section of the track that becomes impassable for any reason, with the exception of check points. 9. All riders must proceed only in the correct direction of the course route or trail. Riding backwards on the race course at any time is prohibited. Riding backwards on the course is grounds for penalties of up to and including disqualification. 10. Reckless riding. No rider may ride in such a manner as to endanger life or limb of other riders, officials or the public. Riders will be penalized for the reckless operation of their machine, including but not limited to the deliberate ramming, blocking or intentional contact with another rider, or for running into an official. 11. Team Tactics are prohibited, and include but are not limited to: blocking, allowing another rider to pass in order to affect the outcome of the race, or exchanging machines in order for another rider to continue the race. Riders involved will be penalized. 12. Unsportsmanlike Conduct. Persons whose appearance, conduct, associations or affiliations, on or off the track, deemed not conducive to the best interest of this sport or who exhibit conduct which is inappropriate, offensive, abrasive or in bad taste, may be excluded or suspended from IATVHSS at the discretion of the Race Director. 1. Starting procedures will be explained at Riders Meeting. All riders are responsible for attending. 2. Riders, pit crew members, machines and equipment are not permitted on the starting line until authorized by the race official. 3. Riders shall line up on their assigned starting row on a first come basis when directed by the race official. 4. All starts are dead engine with the exception of 50, 70 and 90cc classes. The official will signal all riders to turn off their engines and place hands on Helmets. 5. A “10 Seconds” signal will be given before the flag is thrown. At the “10 Seconds” signal, all crew members must step away. 6. Any rider taking off with the wrong row will be penalized. 7. Any rider that misses the start of their class must enter the race course at the starting line and complete the start chute. 8. The event will be timed from the start of the first class in the session for termination purposes. There will be an approximate 1 to 2 min break before the next class begins. 9. Rider is required to start the event with their tether cord properly affixed. 1. Riders must come to a complete stop at all check point and scoring areas. The Scoring area and check points are "No Passing" zones. The No Passing Zones are the Shakane before scoring. 2. It is the rider's responsibility to make sure he has all scans. Missing scans may result in a penalty. LED screen is unofficial. Results will be posted at the end of the race. 3. A rider will be penalized for running into an official. 4. All events will be a two hour timed event, with the exception of 70cc & 90cc which will be 45 minutes&	50cc will be 30 min. Racers have 30 minutes to finish the race after the checkered flag as been shown. 5. A rider must finish the event to be eligible for points and awards. In order to be considered a finisher, a rider must complete at least 50 % of the laps of the winner of his class. 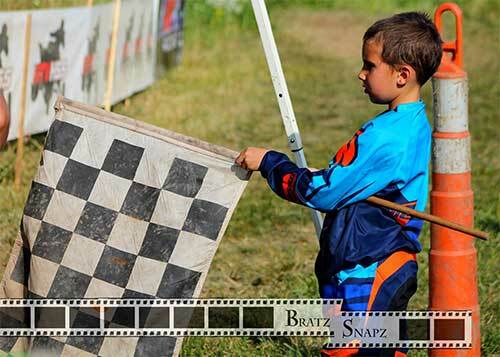 It is not necessary to take the checkered flag. 1 point will be awarded for any rider that starts the race but fails to complete 50% of the laps of the leader. 6. Riders may get mechanical assistance on the course from their pit crew or spectators, but must finish the race under the machine's own power or by the rider physically. 7. Final class standings will be based on the accumulation of class points from the point breakdown listed bellow. 8. No towing allowed. If a machine is towed in from the course, that lap will not count. 9. 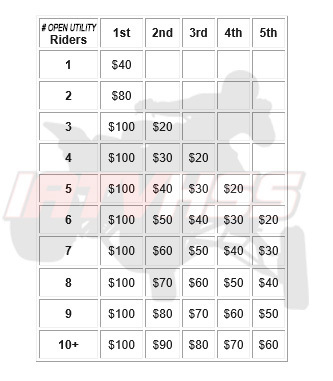 A rider must ride 4 of the 7 races to qualify for year end prizes/awards. 10. 6 of the 7 races will count for year end points with only 1 mandatory throw out with the exception of the AA Class; All races count in the AA Class. 11. A rider may question/protest the scores within the 30-minute period following the posting of the final results. After 30 minutes, awards will be given out. Awards must be picked up no later than following race. 12. Protests must be in writing and comply with the AMA Amateur Competition Rule Book, Protest Procedure. 13. Penalties will be assessed at the discretion of the official based on the severity of the offense, and may include one or more of the following: position(s), lap(s), time penalty, or disqualification. • Ties for the class championship will be broken by the most first place finishes, then by the most second place finishes, and so on as necessary. • Numbers 1 thru 15 are reserved for “AA” class champions from the previous year. • No duplicate numbers within the series, one number per rider. • Any series rider may renew their number before Nov. 15th of that year for the next race season. • After Nov. 15th rider numbers are on a first come basis pending IATVHSS approval. $200 GUARANTEED for 1st Place Winner in AA!